Today, as part of my working day as a Travel Agent, I ventured out to have lunch with our Qantas (the airline) rep. Lunch of course, wasn't the only reason to get together and I received an update on airfares, aircraft etc. 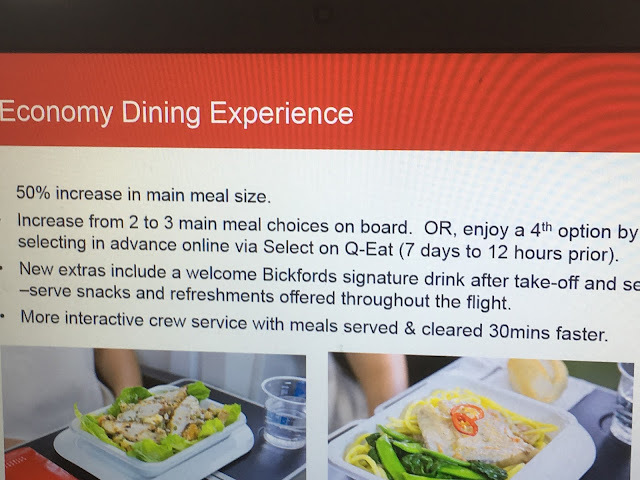 Something that I did like, and I hope other airlines take on board is the ability to pre-order online, your meals on international flights from 7 days to 12 hours prior to departure. No more seeing 2 choices on the menu, ie chicken or steak, and by the time the meal trolley reaches your seat there is no chicken left. There are up to 4 choices if booking online.